Wonton soup is delicious anytime, but when there’s a case of man flu in the house it’s a go to for dinner. It seems half of Melbourne has an attack of the sniffles at the moment- I had my bout the week prior where my go to soup is a traditional chicken and veggie soup. I remember first making wontons years ago and I was just so amazed at how simple they are to make. 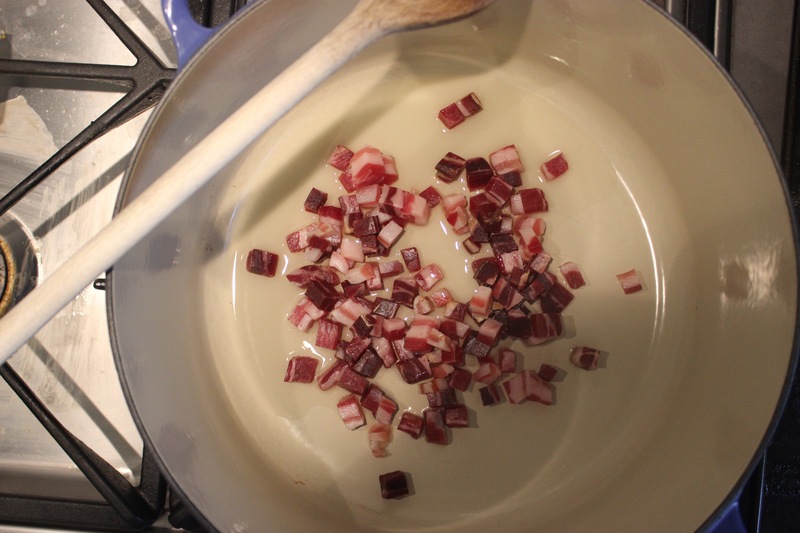 The mixtures I generally use are a pork and prawn base and then there’s lots of little extra’s you can add it for flavour like shiitake mushrooms, water chestnuts for crunch, garlic chives, sesame oil, soy sauce and the list really goes on…. 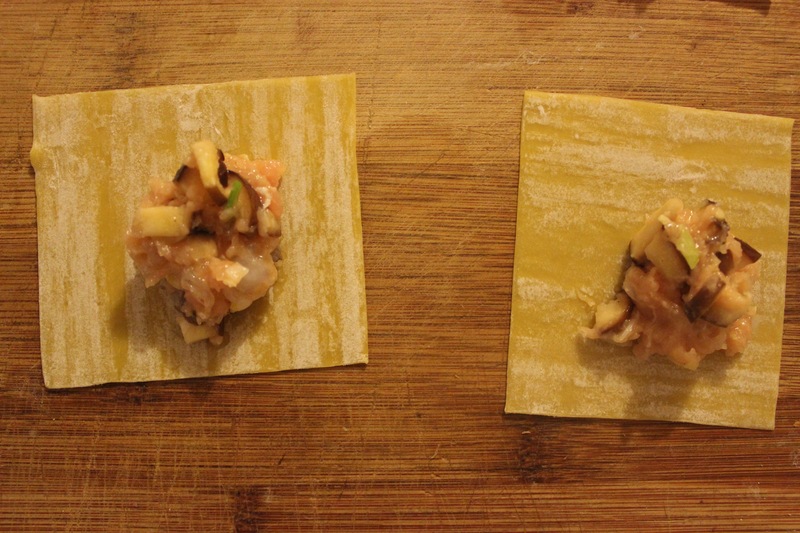 So as always I wanted to try a recipe I hadn’t used before- so I settled on this recipe. Pork, prawn and shiitake mushrooms, in a ginger soy sauce chicken broth with some freshly blanched chinese broccoli and a black vinegar sauce. I opted not to make the chilli sauce, I just used some chilli oil instead and left the chilli component out of the black vinegar sauce. 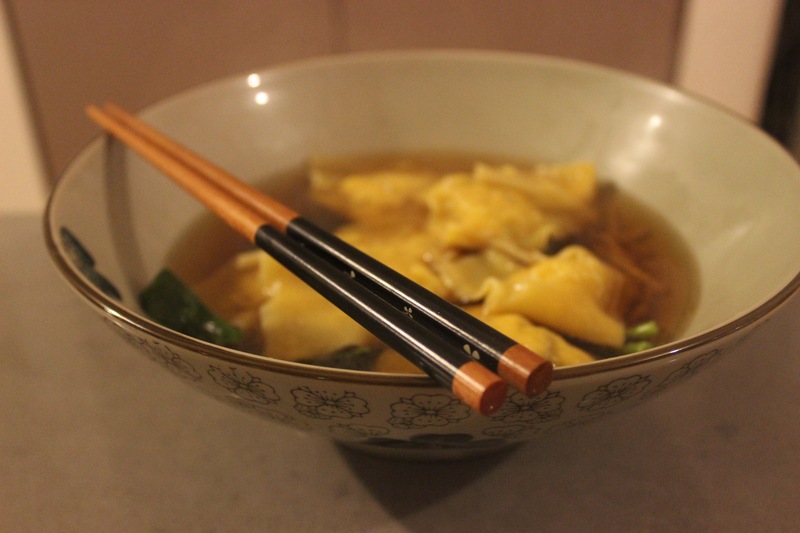 Lots of lovely ginger in the wontons and the soup broth and garlic in the black vinegar sauce- always great things to eat when you have a cold. Making the filling was a chop chop chop and mix it up process- you just need to make sure you cut up everything nice and small and mix it really well to work in the corn flour to make a nice sticky filling. Don’t forget to season the mixture! 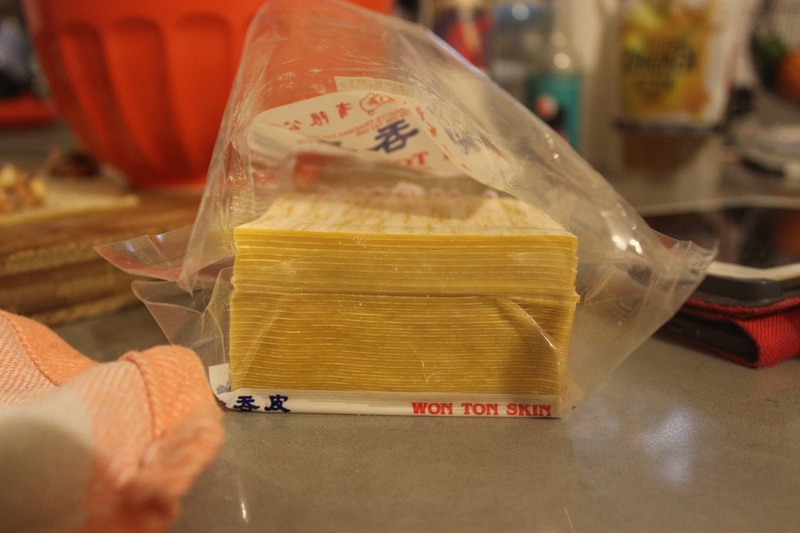 I should have bought a smaller pack of wonton skins because I have quite a few left over. This recipe said it serves 6- that may be ok if it was just an entree- but as this was a main so 4 servings, 32 wontons in total. 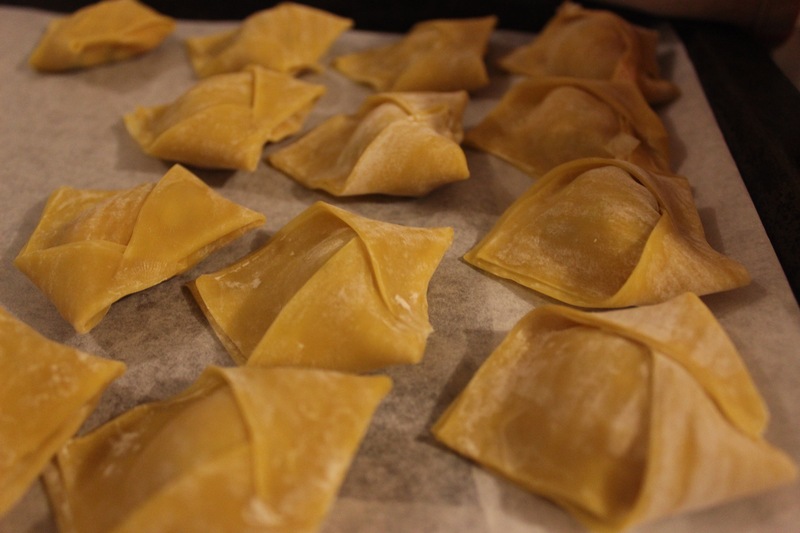 Wonton skins are lovely and silky because of the flour to stop them sticking to one another- these are so cheap and can also be used as a way to make cheats tortellini or ravioli in lieu of fresh pasta dough. Shaping them is straightforward- place a small amount of mixture in the middle and run a pastry brush that’s been dipped in water along each edge. Bring two opposite points together to start to form a triangle and seal the edges. I try to press outwards from the filling to remove any pockets of air. Then lightly dab the two corners of the long side with the pastry brush and bring together to meet in the middle and press down and pinch to seal. I work with about four wonton skins at a time. Do make sure you place some baking paper on the tray so they don’t stick and lay a tea towel over the ones you have made to stop them from drying out. I placed half in the fridge on a tray whilst preparing the rest of the soup and the other half were on a tray in the freezer- once frozen you can then bag them up for later use. 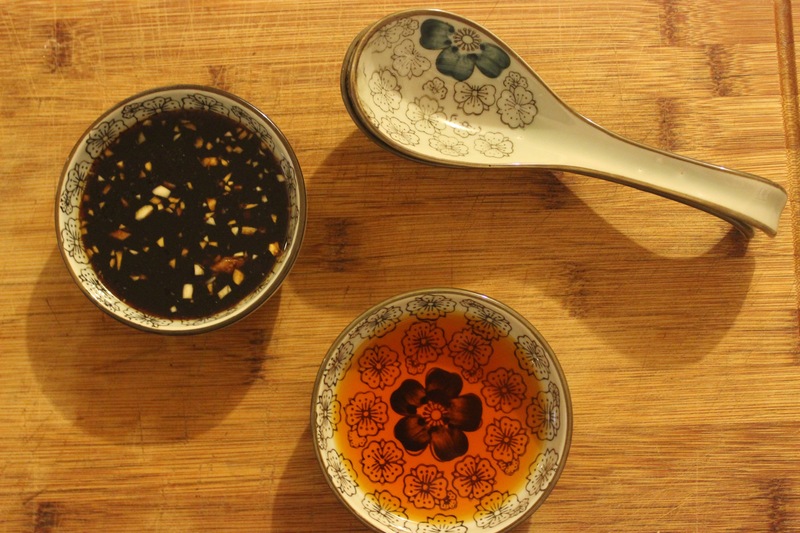 Black vinegar sauce was made in a pinch- chop garlic and ginger and mix with the other ingredients. Soup base followed similar route, heat up the stock with ginger and sesame oil and soy sauce. 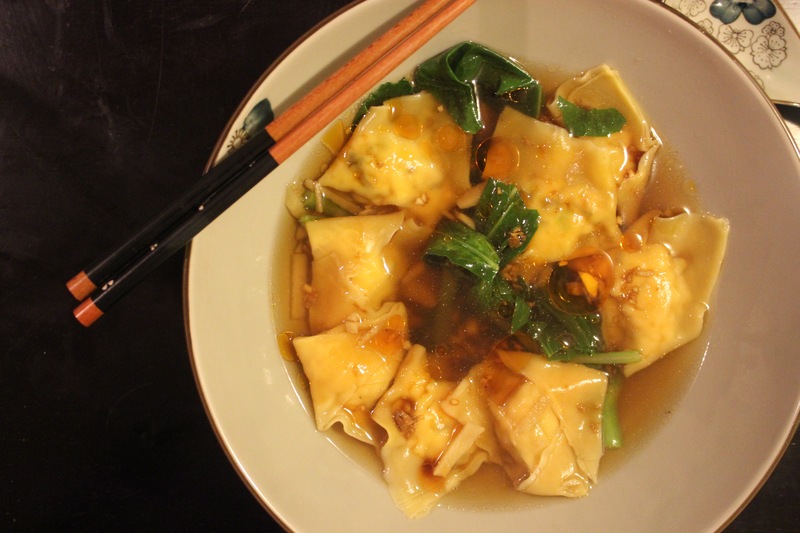 Blanch the chinese broccoli (gai lan) and place in the bowls, boil the wontons and divvy up, pour the hot stock over the top and add the chilli oil and black vinegar sauce to taste. This soup is so great- you can make the wontons in advance and the assembly when ready takes no time at all. Do have some tissues/napkins nearby when eating this- the wontons are quite slippery and can cause bit of a splash when falling back in the bowl (I am not a graceful eater) and I was a little heavy handed with the chilli oil so I was definitely needing the tissues to blow my nose! The wontons that I placed in the freezer didn’t last for long at all- we had them for lunch today! 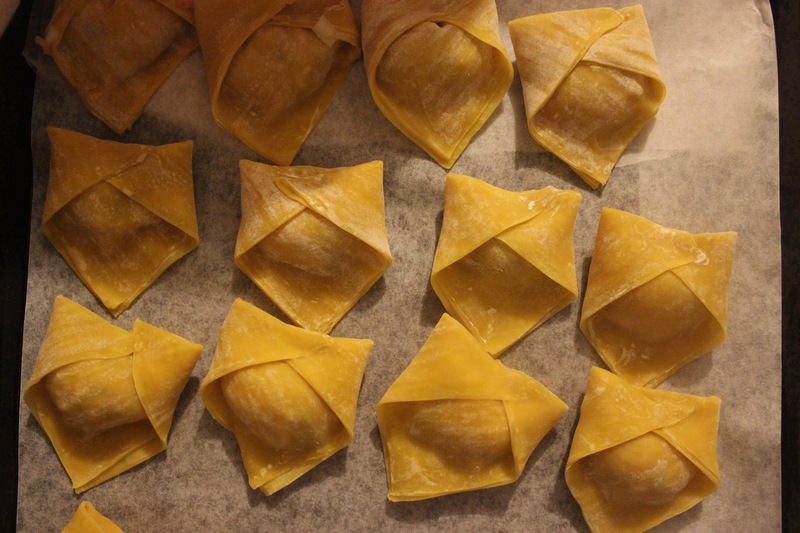 I have so many wonton skins left over in the fridge so I might make the wontons again this week and set them aside in the freezer. Perfect for days when I get home from work a bit later. Do you have a go to recipe when you’re not well? What is it? 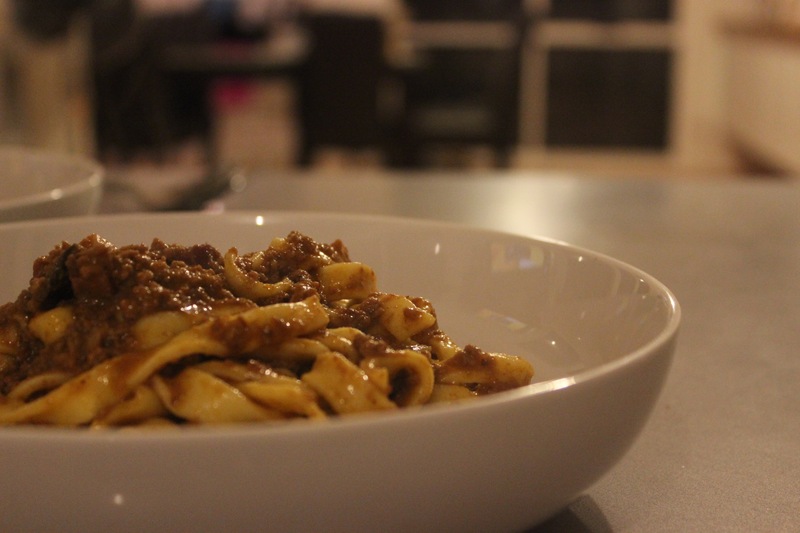 A few weeks ago I was really craving a hearty slow cooked meat sauce for pasta- one of those blip away on the stove for hours, make the house smell amazing and be rich and rib stickingly delicious kind of sauces. Well I found the recipe,made it, froze leftovers and we ate them too over the following weeks. And it’s in this gloomy, wet, grey and frosty Melbourne weather I’m craving it again. Glass of red here wouldn’t go astray either! Ingredient wise it’s not crazy or out there- I opted to grind the meat myself and the only thing you may need to hunt for at a deli would be dried porcini mushrooms and flat pancetta- but if you couldn’t find those things I think you could just sub in dried shitake mushrooms and just your ready sliced pancetta- easy! Surprise surprise the recipe was from gourmet traveller. 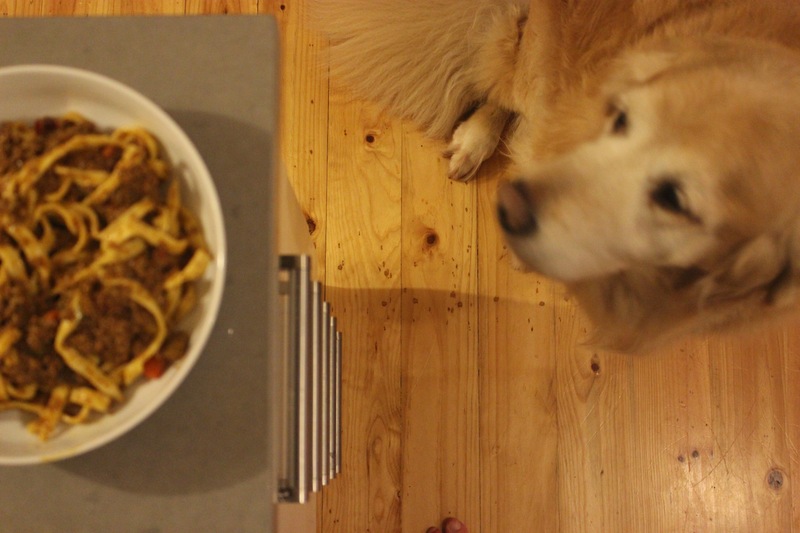 Ragu alla bolognese- it’s straightforward really, brown the minced chuck and pancetta, toss in the veggies (usual bolognese suspects carrot, onion and celery) add the stock and cook it down. It’s the small additions to this recipe that make it stand out. Like sprinkling the butter over the meat to melt in, the earthy mushrooms, bitey sage and stirring through a dollop of cream at the very end. Just writing about it is almost making me dribble onto the keyboard! 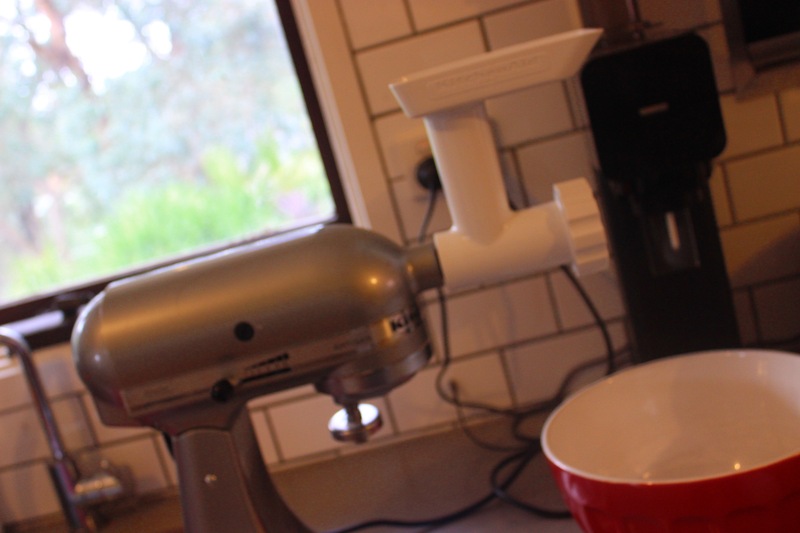 First things first- grind the meat (if you don’t buy it ground already). 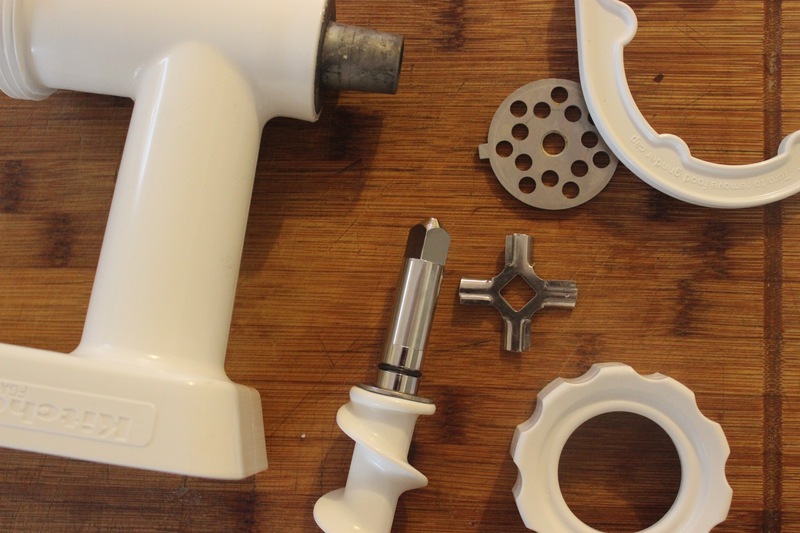 I use the grinding attachment that I have for my kitchen aid and it is the best thing ever- and actually really well priced in comparison to some of the other attachment bits. Chop the pancetta into small cubes and brown it with the beef in a really big heavy based pan- I used big blue, my gorgeous big big big Le Creuset. 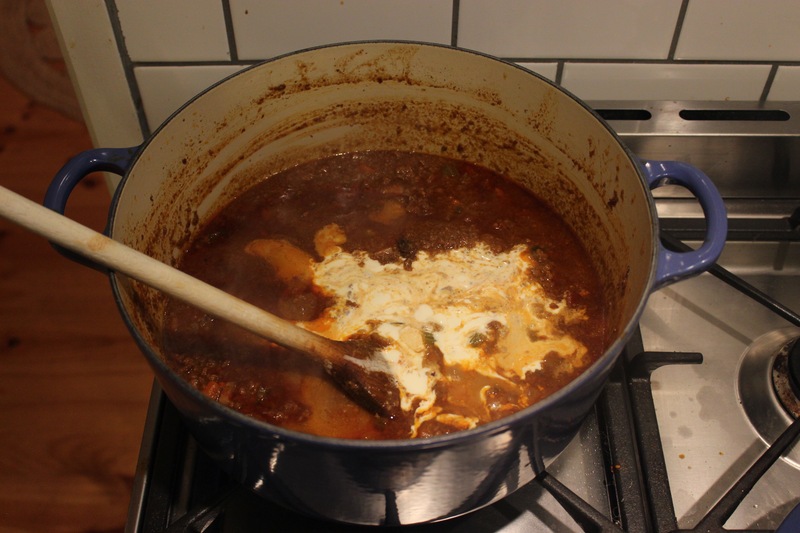 From this point is just a case of adding the rest of the ingredients to the pot in a couple of stages and then gradually reducing and cooking down the liquid until you’ve got a lovely rich and thick ragu. The recipe said to cook for about 1.5 hours but I was probably just nudging over the 2 hour mark. 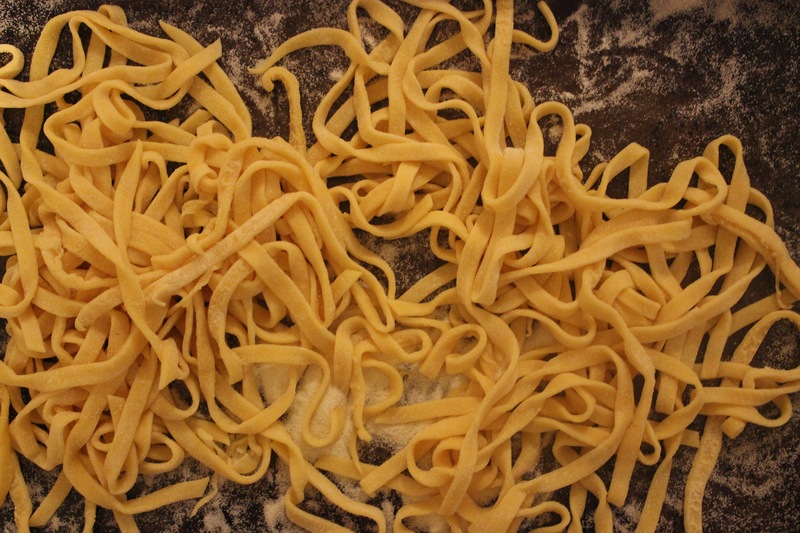 While it was bubbling away I also made some fresh pasta- it was pretty tasty but my only complaint was that I didn’t roll it out thin enough- always time for more practise in the future! Thanks to the number of egg yolks it was the most glorious yellow colour. This sauce is meaty and rich in flavour- very different to your stock standard spag bol where it’s a much more tomato flavoured and much lighter on in flavour. With the cold weather well and truly at our doorstep set some time aside on the weekend and let this bubble away- even better you’ll have lots of leftovers for other chilly nights.